NSRAP’s 2012 Community Hero Awards Gala will be held on Saturday, October 20th at 6 p.m. at the Marriott Halifax Harbourfront (1919 Upper Water Street). 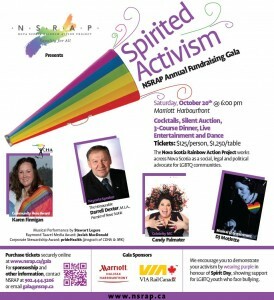 This Gala is the annual celebration of the important work completed by NSRAP. It is also a time to celebrate the contributions of member of our communities and allies. The evening consists of cocktails, a silent auction, a three-course dinner with live entertainment and is followed by a dance. In honour of Spirit Day, we encourage you to demonstrate your activism by wearing purple to demonstrate for LGBTQ youth who face bullying. We are proud to welcome the Honourable Darrell Dexter, M.L.A., Premier of Nova Scotia and leader of the Nova Scotia NDP as our keynote speaker. Candy Palmater will be reprising her role as our Celebrity Mistress of Ceremonies. She is a self-proclaimed recovered lawyer who turned from the courts to the comedy stage. Local Haligonian performer Stewart Legere will entertain us with his musical stylings. Following the gala, DJ Motlette will open up the dance floor. Corporate Stewardship Award: prideHealth – prideHealth is collaboration between the Capital District Health Authority and the IWK focusing on LGBTIQ health care in Halifax. Their achievements are both public (creating an It Gets Better video, having the pride flag raised at CDHA & IWK facilities and hosting lectures) and private (taking public health officials on a tour of a bathhouse, reaching out to media to provide information on STIS, being a resource for patients and health care provider alike). Individual tickets have closed as of 12:30 p.m. on Tuesday, October 16th. If you are still interested in attending, please contact us to see if we can make arrangements. Please note that no special meal orders can be placed now. Sponsorship opportunities, ranging from silent auction donations to title sponsors, are available. See the options in our Sponsorship Package.